Central Venous Pressure: Its Clinical Use and Role in Cardiovascular Dynamics focuses on the clinical applications of central venous pressure and the role it plays in cardiovascular dynamics. 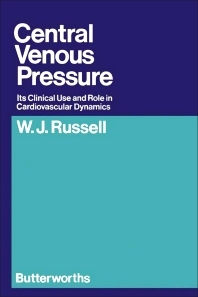 This book discusses the clinical need to measure central venous pressure, describes the apparatus and its use, and considers the interpretation of the measurements. This text is comprised of five chapters divided into two sections and begins by introducing the reader to the cardiovascular system and its function; the significance of the central venous pressure in cardiovascular dynamics; and the interaction between venous return and cardiac function. The discussion then turns to the principles and techniques of measuring cardiac output and evaluation of central venous pressure. Two factors that affect the normal range, the intrathoracic pressure and the reference level, are highlighted. The final chapter explains the use of the central venous or right atrial pressure in clinical practice to detect changes in blood volume and testing of the equivocal level of central venous pressure using a fluid load or isoprenaline. This book is intended for physiologists and clinicians, including surgeons and anesthesiologists.